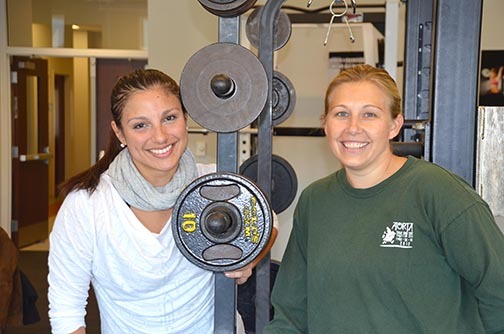 Kinesiology Ph.D student Lorena Salom (left) and Dr. Danielle Wadsworth in the lab space used for the women’s exercise study. Professors and graduate students in the School of Kinesiology are concluding a 12-week women’s exercise study in the new Kinesiology Building. The study involves women, ages 40 – 64, who were recruited to participate in concurrent training three days a week for one hour per session. Concurrent training means they are combining high-intensity interval aerobic training with resistance, or weight, training. Kinesiology doctoral student Lorena Salom, who helps Associate Professor Dr. Danielle Wadsworth run the program, said the study combines outreach and research. There is an obvious outreach component as the women get specialized health guidance from exercise experts. But there is also a research component. Wadsworth said the women develop social networks and enjoy the guidance they receive from Salom and other graduate students, which is a huge help at the outset of the program. The sessions are offered three days a week at three different times: early morning, mid-day, and late afternoon. To learn more about exercise research programs, of which there are several in the School of Kinesiology, contact Dr. Wadsworth.